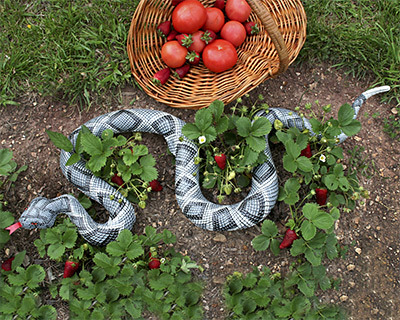 Humanely deter birds from congregating around your garden, deck, or sailboat with these Gardeneer Natural Enemy Inflatable Snakes. These three, plastic units perfectly mimic the shape and colors of a rattlesnake, creating a natural deterrent for birds. The approximate 64" length of each snake keeps them easily visible, and their curved shape adds a realistic position. The gray, brown, and tan tones further the lifelike appearance, enhanced even more by the forked, red tongue on each. These units can be placed on the ground in your garden, atop a berry bush, or even on tree limbs to keep birds out of your orchard. For even more placement options, float the snakes in your pond or anchor them along its bank. The red eyes on each piece offer a striking look to them, sure to repel smaller animals in a natural manner. Move each snake regularly to keep them effective, as this will stop birds from acclimating to them. The plastic construction of each unit offers strength, and the items may be deflated at the end of the season for easy storage. Keep birds from overtaking your dock or garden with these Natural Enemy Inflatable Snakes. Note: This case pack includes 3 of the Gardeneer Natural Enemy Inflatable Snakes.